Soak Up The Sun [E6034] - $9.00 : Yarn Tree, Your wholesale source for cross stitch supplies. 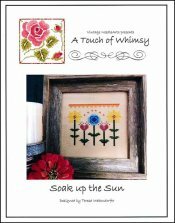 A cross stitch pattern from Vintage NeedleArts. The forecast calls for a sizzlin' hot summer! Five flowers are "soaking up the sun." The first flower is yellow, like rays from the sun. The second flower design is of a heart. The third flower is a blue quilt block design. Jump into summer & "Soak Up The Sun." Stitch count is 78W x 69H.